Endovascular thrombectomy for large vessel ischaemic stroke substantially reduces disability, with recent positive randomised trials leading to guideline changes worldwide. This review discusses in detail the evidence provided by recent randomised trials and meta-analyses, the remaining areas of uncertainty and the future directions for research. The data from existing trials have demonstrated the robust benefit of endovascular thrombectomy for internal carotid and proximal middle cerebral artery occlusions. Uncertainty remains for more distal occlusions where the efficacy of alteplase is greater, less tissue is at risk and the safety of endovascular procedures is less established. Basilar artery occlusion was excluded from the trials, but with a dire natural history and proof of principle that rapid reperfusion is effective, it seems reasonable to continue treating these patients pending ongoing trial results. There has been no evidence of heterogeneity in treatment effect in clinically defined subgroups by age, indeed, those aged >80 years have at least as great an overall reduction in disability and reduced mortality. Similarly there was no heterogeneity across the range of baseline stroke severities included in the trials. Evidence that routine use of general anaesthesia reduces the benefit of endovascular thrombectomy is increasing and conscious sedation is generally preferred unless severe agitation or airway compromise is present. The impact of time delays has become clearer with description of onset to imaging and imaging to reperfusion epochs. Delays in the onset to imaging reduce the proportion of patients with salvageable brain tissue. However, in the presence of favourable imaging, rapid treatment appears beneficial regardless of the onset to imaging time elapsed. Imaging to reperfusion delays lead to decay in the clinical benefit achieved, particularly in those with less robust collateral flow. The brain imaging options to assess prognosis have various advantages and disadvantages, but whatever strategy is employed must be fast. Ongoing trials are investigating extended time windows, using advanced brain imaging selection. There is also a need for further technical advances to maximise rates of complete reperfusion in the minimum time. Endovascular thrombectomy for large vessel ischaemic stroke has been demonstrated in recent randomised trials to be one of the most powerful treatments in any field of medicine, with a number needed to treat of 5.1 patients to achieve an extra individual with independent functional outcome.1 The five positive trials published in 20152–6 (table 1) have led to guideline changes in the USA,7 Europe8 and Canada,9 with many other countries in the process of updating their recommendations. Despite the clear-cut evidence for endovascular thrombectomy, there remains a need for clinical judgement in patients who do not neatly fit the patient population enrolled in the trials. There are also major logistical challenges in providing widespread access to this therapy across disparate health systems and geography. This review will discuss the evidence and how best to implement endovascular thrombectomy to maximise the potential to reduce stroke disability. All the positive trials required proof of large vessel occlusion using non-invasive angiography, mostly CT angiography (CTA). An unequivocally hyperdense artery, particularly when visualised using thin slice non-contrast CT, has high sensitivity and specificity for acute occlusive thrombus.10 However, CTA documentation of the occlusion is regarded as standard procedure and should extend from the aortic arch to also allow assessment of the proximal vascular access to plan an endovascular approach. Some institutions have attempted to selectively perform CTA only in those with more severe strokes where large vessel occlusion is more frequent. However, patients with mild clinical syndromes still have a substantial incidence of large vessel occlusion (approximately 10% in those with National Institutes of Health Stroke Scale (NIHSS) <6) and these patients are at risk of subsequent clinical deterioration.11 A routine approach to imaging with both CT and CTA is simple, and the uniform workflow is likely to lead to faster and higher quality acquisitions due to radiographer familiarity. It has been suggested that initial imaging could occur in the angiography suite. While this is now technically possible, the proportion of all suspected patients with stroke who proceed to endovascular therapy is <10%, which would likely lead to inefficient use of angiography room resources unless some prior triaging had occurred. Which arterial occlusions are suitable for thrombectomy? The trials all included intracranial internal carotid artery (ICA) and middle cerebral artery (MCA) occlusions in the ‘M1’ (horizontal segment proximal to the Sylvian fissure and usually prior to bifurcation). Relatively few ‘M2’ occlusions (postbifurcation in the Sylvian fissure) and virtually no anterior or posterior cerebral artery occlusions were treated. These smaller arteries present a greater technical challenge with currently available endovascular devices and, given the smaller area of brain at risk and the greater likelihood of recanalisation with intravenous thrombolysis, the risk–benefit remains uncertain. However, there was no statistical evidence of treatment effect heterogeneity in the patients with M2 occlusion in the trials.1 M2 vessels can supply a highly variable territory of brain, and treatment of patients with significant symptoms and accessible occlusions in proximal M2 vessels is therefore entirely reasonable. Extra-cranial carotid occlusion was excluded from SWIFT PRIME due to regulatory requirements to avoid adjunctive carotid angioplasty or stenting. Nonetheless, enough patients were randomised in the other trials to demonstrate clear benefit of endovascular treatment in patients with ‘tandem’ cervical ICA and intracranial occlusion.1 However, the optimal treatment strategies for this scenario, that is, stenting versus angioplasty, which order to treat the extra-cranial and intracranial occlusions, and which antithrombotics to use postprocedure to balance re-thrombosis versus haemorrhagic transformation risk, are yet to be determined. Basilar artery occlusion was excluded from all trials. One small randomised trial found a strong relationship between recanalisation and improved outcome analogous to the anterior circulation.12 There is an ongoing randomised trial in this population (BASICS13 clinicaltrials.gov NCT01717755). However, in centres not involved in the trial, the dismal natural history associated with persistent basilar artery occlusion and seemingly good technical results with modern devices would suggest that endovascular thrombectomy is an appropriate management option. It is often suggested that the time window for recanalisation of basilar thrombosis may be longer than for anterior circulation occlusion, but trial evidence is lacking. Do clinical variables influence benefit from thrombectomy? It is important to distinguish prognostic parameters from treatment effect modifiers. Older age, for instance, is associated with worse outcome regardless of the treatment offered. However, the differential benefit of thrombectomy over intravenous thrombolysis was at least as great in those aged >80 years versus younger patients. Indeed, while in meta-analysis of the trials, overall mortality with thrombectomy was similar to control, in the population with age >80 years, mortality was significantly reduced from 40% to 20%. We consider that there should be no upper age limit for thrombectomy (figure 1). A 92-year-old man presented with left hemiparesis, dysarthria, hemianopia and inattention National Institutes of Health Stroke Scale (NIHSS) 19. 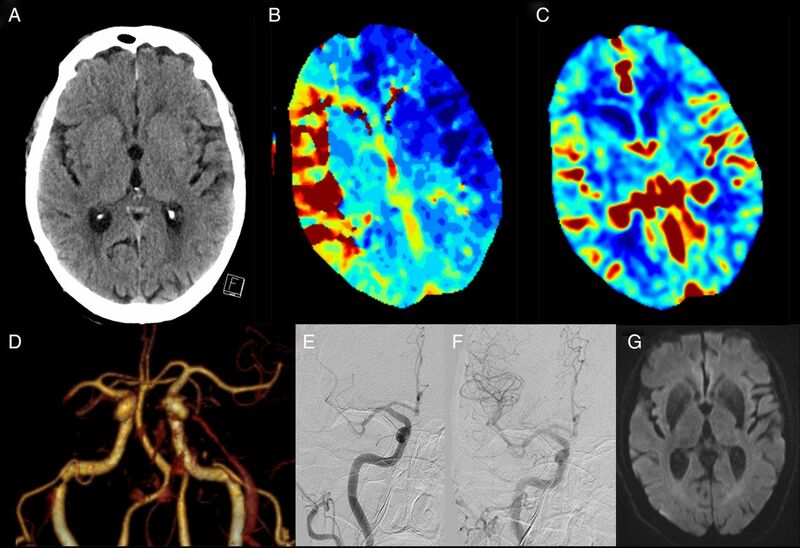 (A) Minimal non-contrast CT ischaemic changes with CT perfusion demonstrating (B) large Tmax lesion in the right middle cerebral artery (MCA) territory and (C) preserved cerebral blood volume indicating minimal irreversibly injured ischaemic core, that is, excellent collaterals and a large ischaemic penumbra. (D) CT angiography revealed a distal M1 MCA occlusion. The patient was treated with intravenous alteplase 80 min post-onset. (E) Partial recanalisation was observed at initial angiogram and he proceeded to Solitaire endovascular thrombectomy; (F) successful revascularisation (mTICI 3) at 2 h post-onset. NIHSS 3 at 24 h with (G) minimal diffusion lesion on MRI. The patient was discharged to rehabilitation on day 5. Greater clinical severity has been suggested as a marker of improved response to endovascular thrombectomy.14 However, the individual patient meta-analysis indicated a consistent treatment response across the full spectrum of baseline NIHSS scores enrolled. Few patients with NIHSS <6 were enrolled in the trials due to exclusion criteria and the natural distribution of NIHSS in patients with large vessel occlusion. However, when deciding whether to treat, it is important to consider the risk of subsequent deterioration, which may be substantial.11 Our policy is to consider treatment in patients with large artery occlusion and mild neurological impairment. Patients ineligible for intravenous thrombolysis due to bleeding risk or delayed presentation were included in MR CLEAN, ESCAPE and REVASCAT. There was a clear-cut benefit of endovascular thrombectomy over standard care in these patients. However, the fact that all eligible patients did receive alteplase prior to thrombectomy is important. While there are theoretical concerns that alteplase has low rates of successful revascularisation in large vessel occlusion and may independently increase the risk of symptomatic intracerebral haemorrhage, there are currently no data to support omission of alteplase in eligible patients. There are patients in whom endovascular thrombectomy fails or is substantially delayed, for example, due to poor vascular access or interhospital transfer. To deny these patients alteplase would be ethically challenging outside the context of a carefully constructed randomised trial. However, given some uncertainty, trials are being planned to test the safety and feasibility of direct thrombectomy versus the current bridging approach, similar to the cardiac paradigm where endovascular treatment without intravenous thrombolysis is the standard treatment for ST elevation myocardial infarction unless delays in starting the procedure are anticipated. Is further imaging beyond CT/CTA necessary? The MR CLEAN trial succeeded with a simple strategy of excluding haemorrhage on non-contrast CT and identifying large vessel occlusion on CTA. There were no additional criteria about the extent of parenchymal injury although clinician discretion was allowed. With this strategy, only 6% of patients had ASPECTS 0–4. Whether this represents the unselected prevalence of low ASPECTS in the presence of large vessel occlusion within 6 h of stroke onset is not well understood. However, the median ASPECTS in MR CLEAN was 9, identical to the more selective trials. Non-contrast CT ASPECTS is superficially simple but interpretation when estimating the region of irreversible injury is considerably more complicated than, for instance, the output from automatically processed CT perfusion (CTP) imaging. Non-contrast CT changes are subtle and prone to inter-rater variability in interpretation. This may be improved through concurrent examination of CTA or CTP images.15 Changes also take some time to develop and are therefore insensitive early after stroke onset. ASPECTS points are not well correlated with volume16 and are also not related to the variable functional eloquence of different brain regions. Three points can be lost for caudate, lentiform and insula involvement (which in isolation will generally be minimally clinically symptomatic) or for involvement of three large segments of cortex, which could leave the patient severely disabled. In contrast, CTP can provide a spatially defined and volumetric estimate of irreversibly injured tissue. Clinical judgement is still required to assess the likely functional consequences of the lesion. While not as precise as diffusion MRI, performance of CTP core in recent trials matched well with follow-up infarct volume.17 This performance was achieved using fully automated processing software that standardised the map construction and thresholding across multiple hardware platforms, and allowed a rapid and objective assessment of ischaemic core and tissue at risk.18 ,19 It is possible that the thresholds used to define the core using CTP may require adjustment if ultrafast recanalisation is achieved through improved workflow. A threshold of relative cerebral blood flow <30% of normal brain has been validated against concurrent diffusion MRI to identify irreversible injury and performs well in the range of imaging to reperfusion delays usually seen in current practice.20–22 However, if complete recanalisation is achieved within 90 min of imaging, a threshold of <20% relative cerebral blood flow may be more appropriate.21 This potential to save previously unsalvageable brain, simply by treating faster, is an exciting development. Collateral grading using CTA is often seen as an intermediate level of imaging between the simple non-contrast CT/CTA vessel occlusion paradigm and a CT/CTP/CTA multimodal CT approach. The challenge with grading collaterals on static CTA is that the acquisition is generally timed to peak arterial phase and, with fast modern scanners, the collaterals have often not filled at that time, leading to underestimation of collateral quality and a risk of excluding patients who could benefit from reperfusion. Multiphase CTA overcomes this pitfall by repeating the imaging 5 and 10 s after the initial acquisition.23 Essentially, this is a three-phase CTP acquisition and the same information can be gained by examining CTP raw data. It has the advantage of requiring no postprocessing but relies on a visual estimation of the collateral score, which can be subjective. MRI provides exquisite imaging of acute stroke pathophysiology and is used as the primary modality in a limited proportion of centres worldwide. The main challenge is that, although the imaging can now be acquired rapidly (eg a 6 min multimodal protocol24), in most institutions, screening the patient for MRI safety and immediately accessing a busy clinical scanner generally cause unacceptable delays. The concept that MRI may be useful as an arbiter of treatment in borderline cases is problematic. Patients with ‘borderline’ collateral quality require ultrafast reperfusion if benefit is to be achieved.25 Delaying a therapeutic decision in order to perform an MRI condemns such patients to a reduced potential benefit by the time treatment is considered. We have moved away from multimodal MRI and now routinely use CTP. There is no doubt that rates of good outcome are significantly lower in patients with a large ischaemic core, be it assessed using non-contrast CT ASPECTS, collateral grading, CTP core volume or diffusion MRI. Further analyses of the interaction of these imaging parameters and treatment effect are ongoing but, to date, it has been difficult to define a group of patients where there is convincing lack of a trend to benefit from reperfusion.26 ,27 As most trials excluded patients with a large irreversibly injured ischaemic core, further prospective studies in this group will be required. We would consider thrombectomy in patients with a large ischaemic core, particularly in younger age groups and patients presenting in the first few hours after stroke onset. The decision to use general anaesthesia versus conscious sedation has been the topic of much debate. Early studies showed worse outcome associated with general anaesthesia but were confounded by indication, that is, more medically unwell patients with poorer prognosis were more likely to undergo general anaesthesia. The MR CLEAN trial addressed this issue as centres chose an institutional strategy and only 4% of patients at conscious sedation sites crossed over to general anaesthesia. Treatment effect was clearly greater in those treated awake.28 There are ongoing randomised trials that may definitively settle this question, but for now, it is difficult to justify a routine policy of general anaesthesia. There are no data to suggest procedural complications are reduced by anaesthesia; awake patients can be assessed neurologically during the procedure and the almost inevitable hypotension associated with induction of anaesthesia may well lead to reduced collateral flow and worse outcome. We always attempt to manage with local rather than general anaesthesia, unless there is airway compromise or severe agitation. Revascularisation success has been variably defined. There is widespread consensus that the current standard of mTICI 2b/3 (>50% reperfusion of the affected arterial territory) is too lenient. While the pursuit of 100% reperfusion (mTICI 3) may not always be prudent, many experts feel that a target of >90% (to allow for very minor distal occlusions where further treatment would incur unacceptable risk) is a more appropriate benchmark. The time taken to achieve this result must also be considered. There is little value in mTICI 3 over 2b if the extra reperfusion has occurred several hours later. The concept of ‘first pass’ revascularisation has therefore entered the literature,29 and could perhaps be better operationalised for studies of new devices as ‘base catheter to reperfusion time’. The key principles that can be distilled from the positive endovascular trials are to achieve rapid and complete reperfusion, and to consider the extent of pre-existing irreversible injury when weighing the potential risks and benefits of treatment. The positive trials deliberately selected patients most likely to benefit, and achieved a number needed to treat for functional independence of 5.1 and only 2.6 for at least 1 grade improvement in modified Rankin Scale (mRS). However, in clinical practice, a substantially larger number needed to treat although more difficult to appreciate treatment effect in one's own day to day experience, would generally be regarded by clinicians and patients as worthwhile. Hence, there are relatively few sound reasons not to perform endovascular thrombectomy in a patient with ICA or proximal MCA occlusion, unless there are severe comorbidities (box 1). Patients with less favourable imaging have even less time to achieve beneficial reperfusion, hence selection approaches that substantially delay treatment are to be discouraged. CTP and multiphase CTA have proven their worth as rapid modalities that identify patients with favourable response to reperfusion in the randomised trials. There is still considerable room for improvement in reducing delays to revascularisation and in increasing rates of complete revascularisation on first pass of the device. These system and technological refinements hold the key to maximising benefit from reperfusion therapies. Age: No justification for arbitrary upper age limits. Older age is associated with worse prognosis but treatment effect is consistent across the age spectrum. Pre-morbid function: Important to consider current quality of life and probability of maintaining an acceptable quality of life. This can be challenging to accurately assess in the emergency department and, if in doubt, it is best to err on the side of treating. Stroke severity: Patients with National Institutes of Health Stroke Scale (NIHSS) ≥6 definitely benefit. No upper limit for severity has been demonstrated. Milder patients still have approximately 10% incidence of large vessel occlusion and so CT angiography (CTA) should be routine. This group has a high risk of later deterioration.11 If symptoms are uncharacteristically mild, consider whether the occlusion could be chronic, particularly relevant in Asian countries with high prevalence of intracranial atherosclerosis. Tandem occlusion of the internal carotid artery: Very strong benefit in this subpopulation. Stenting before versus after thrombectomy is controversial. In general, removal of the intracranial occlusion to allow collateral flow via circle of Willis is logical, followed by treatment of the cervical ICA, unless this is impassable. Distal MCA (M2) occlusion: Uncertain benefit in trials. Consider territory at risk (clinical signs and/or perfusion lesion and accessibility of the clot to thrombectomy). Diffusion MRI—more precise than CTP but generally associated with greater treatment delay, which offsets that benefit. Large core volume appears prognostic but may not modify treatment effect as greatly as previously thought. Collateral grade—patients with moderate to good collaterals definitely benefit. Benefit in patients with poor/absent collaterals is uncertain. Assessing collaterals on standard static CTA risks underestimating collateral flow, which is, by its nature, delayed and therefore may not have arrived in the arterial phase imaging. Multiphase acquisition23 or CTP source images31 avoid this problem. Residual anterograde flow—requires dynamic angiography (eg, raw CTP data). There is evidence that thrombolysis works much better33 but it is not sufficient to justify waiting to see if thrombolysis works or for omitting thrombectomy.
. Endovascular thrombectomy for large vessel ischaemic stroke: a meta-analysis of individual patient data from five randomised trials. Lancet Published Online First: 18 Feb 2016. doi: 10.1016/S0140-6736(16)00163-X. European-Stroke-Organization. Consensus statement on mechanical thrombectomy in acute ischemic stroke—ESO-Karolinska stroke update 2014 in collaboration with ESMINT and ESNR. 2015.
. Effect of general anaesthesia on treatment effect in MR CLEAN. International Stroke Conference Late-breaking abstract; 2015.
. Results of the THERAPY trial: a prospective, randomized trial to define the role of mechanical thrombectomy as adjunctive treatment to IV rtPA in acute ischemic stroke. Int J Stroke 2015;10:10. Contributors BCVC conceived and drafted the review with input from GAD, PJM and SMD, who made critical revision of the manuscript. Competing interests BCVC reports research support from the National Health and Medical Research Council of Australia (GNT1043242, GNT1035688), Royal Australasian College of Physicians, Royal Melbourne Hospital Foundation, National Heart Foundation and National Stroke Foundation of Australia, and unrestricted grant funding for the EXTEND-IA trial to the Florey Institute of Neuroscience and Mental Health from Covidien (Medtronic). GAD reports grants from the Australian National Health & Medical Research Council, and non-financial support from Boehringer Ingelheim, and has served on advisory boards for Boehringer Ingelheim, AstraZeneca, Bristol Meyers-Squibb, and Merck Sharp & Dohme, outside the submitted work. PJM reports unrestricted grant funding for the EXTEND-IA trial to the Florey Institute of Neuroscience and Mental Health from Covidien (Medtronic), has served as an unpaid consultant to Codman Johnson and Johnson, and his organisation has received unrestricted research funding and grants from Codman Johnson and Johnson, Medtronic and Stryker. SMD has served on advisory boards or given lectures for Boehringer Ingelheim, BMS and Bayer. Medtronic is supporting the salaries of two stroke fellows at our centre.